I don’t usually buy things in taped-up bags or sealed jars because you can’t see everything and you can’t look over things carefully. It’s a bit of a gamble. I know some folks love buying these, especially jewelry jars, because there is always the hope that there will be some 14k gold item tucked amidst the rubbish. A ring perhaps. Or maybe there will be a fabulous rare watch that no one recognized. But it doesn’t happen very often. 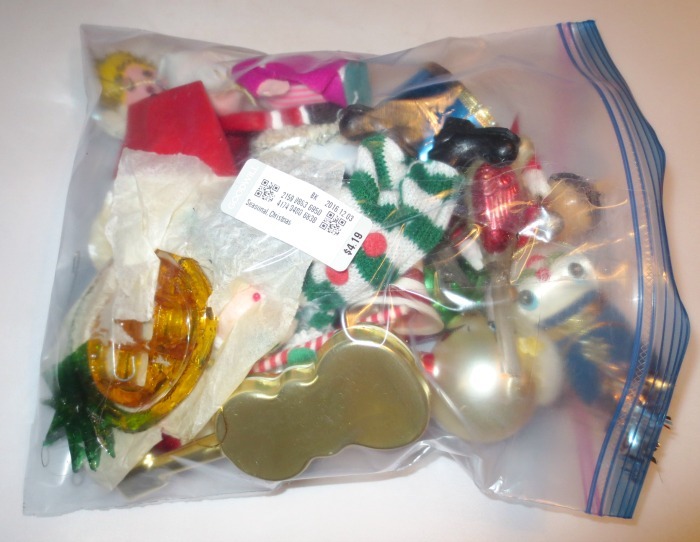 But, uncharacteristically, I decided to check out the Ziploc bags of Christmas ornaments at my local Goodwill. I picked up several, turned them round and round (and round), and set them back on the shelf. Until this bag. Yes, there was some garbage in it, but some pieces looked interesting, and two ornaments looked really old and really fabulous. Can you see them? 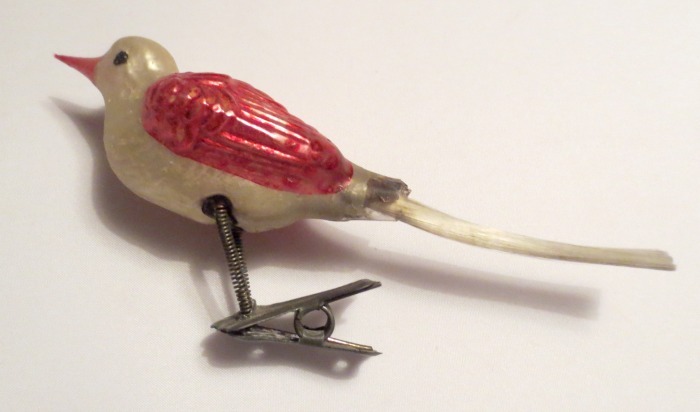 The first I spotted was this wonderful old mercury glass clip-on bird. Circa 1920-1940. I may have to keep this cutie! 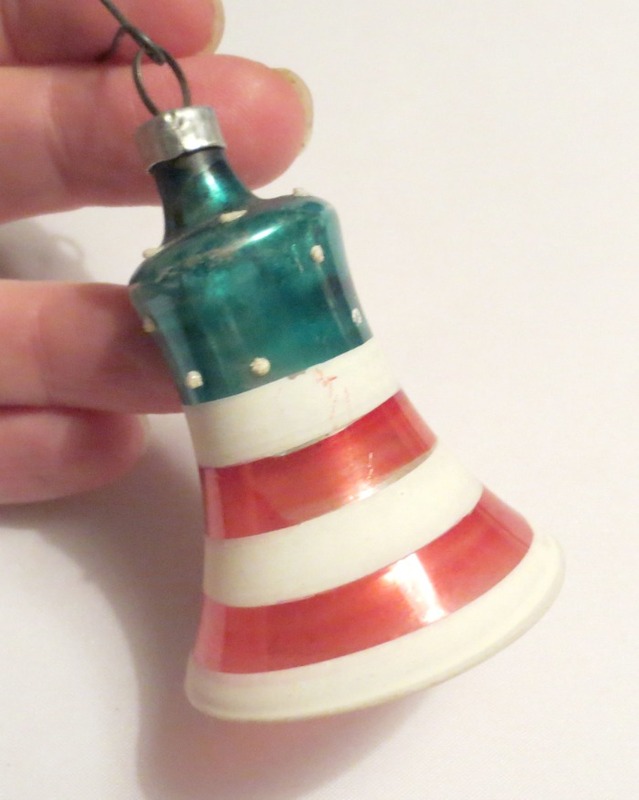 And then this worn patriotic glass bell with clapper. I’m guessing it’s from the 1940s. 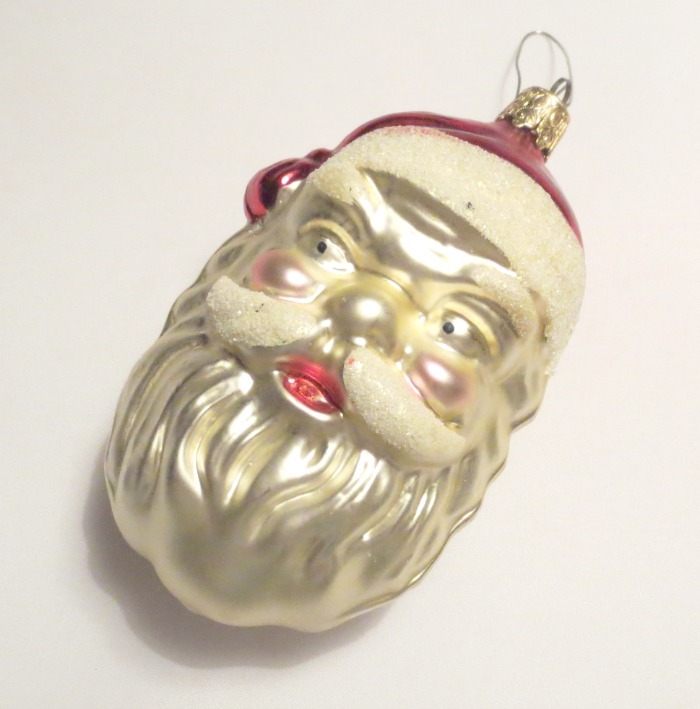 But a few others show promise too…like this Santa. 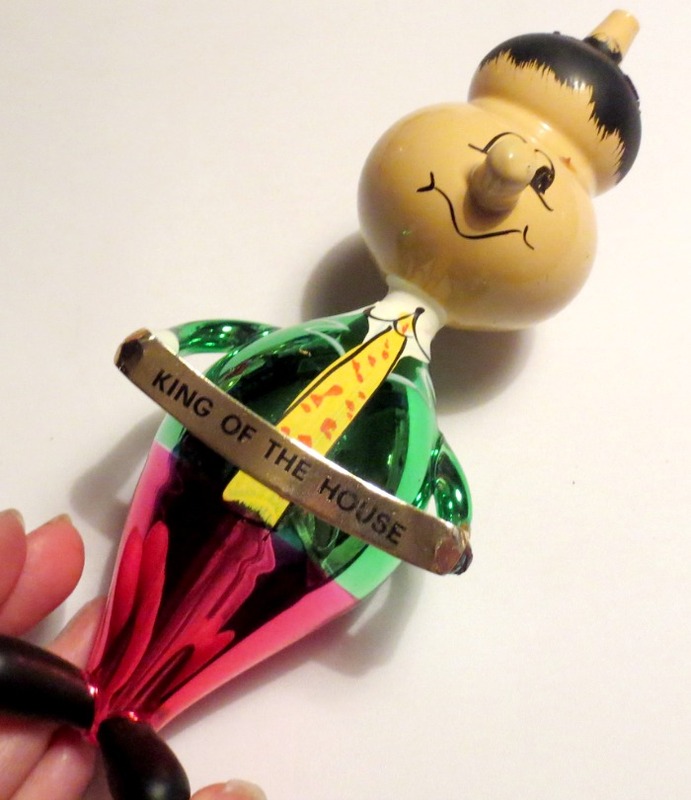 Possibly a 1950s piece, though could be more recent. 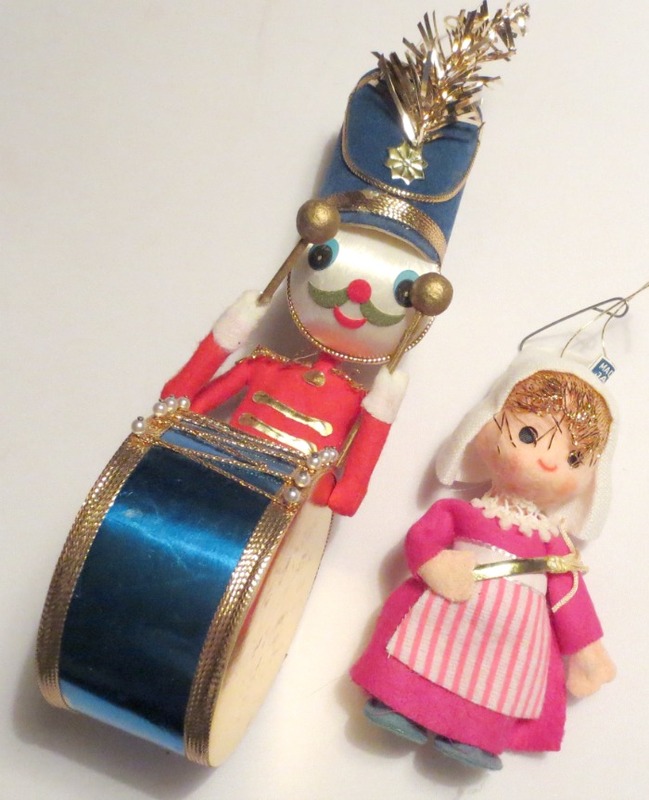 And I think someone will love these vintage made-in-Japan ornaments. But it turns out the best pieces may be a glass cat and a man. Based on the styling, I’ve discovered that these could be Italian, possibly De Carlini’s! Oh boy, if they are, they are very collectible. They typically sell from $25-$75. Still doing more research. 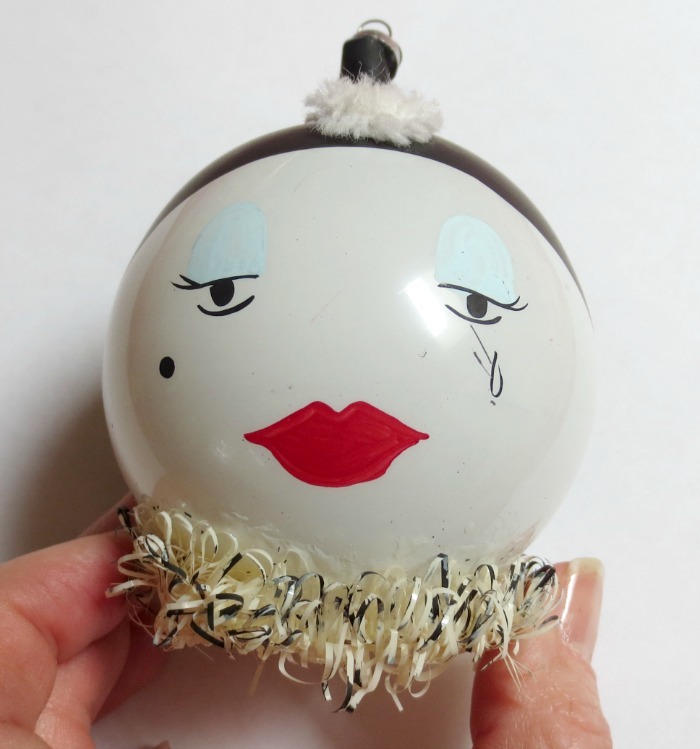 And then there’s a pierrot with tear glass ornament. Anything special?? I’m not sure yet. But overall there are only a few I’m going to toss. The pineapple ornament is made of sugar and has paper stuck to it. 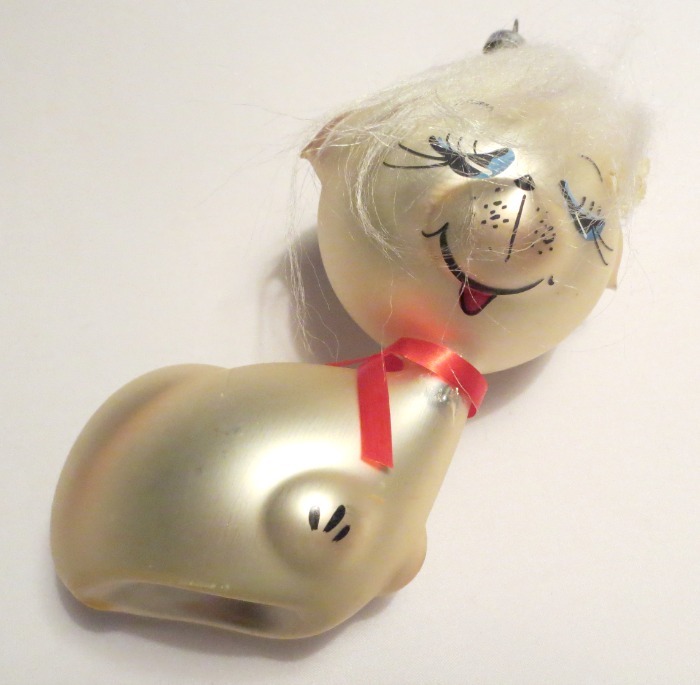 The Santa head is likely a children’s project with glued-on bits. The guitar, which I was hoping was glass, is a very cheap plastic thing that feels like mylar. But overall, I think my $4.19 purchase turned out quite well. 🙂 And it’s been fun researching everything. Would love to hear what you’ve been finding…and as always, happy hunting!